This lecture will be based on new research on the first generation of tourist photography in the United States, particularly on Eastman Kodak Company marketing and its role in promoting tourism abroad. The lecture is based on research that led to the book manuscript (currently under review) titled The Mass Production of Memory: Leisure Travel and Personal Archiving in the Age of the Kodak. This book tells the story of mass photography’s centrality in leisure travel and its significant role in the mass production of memory; a process in which camera users’ social, economic, and political status shaped their participation in mass culture and hence in the creation of future archives. 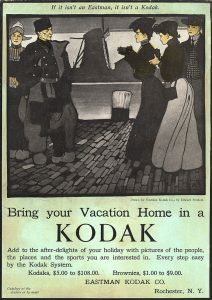 In the four decades following the 1888 introduction of the Kodak (the first portable film camera), many Americans documented their individual experiences of family, community, country, and, sometimes, the rest of the world. Increasing mobility paired with increasing leisure time to create a historical moment in which those who could afford even a bit of both took embraced every opportunity to do so. This process fed into a renewed interest in heritage: the individual’s responsibility to shape one’s world also extended to one’s past as well. New opportunities for personal recording magnified the importance of personal archiving and created new obligations for an accounting of oneself: one’s status, ambitions, values, and personality could—and should—be preserved for assessment by others. This lecture will examine the relationship between the personal archiving imperative and US citizens’ approaches to international travel.